In alternating chapters that reveal a nascent period in their development as two of the twentieth century's most influential writers, Beat Generation icons William S. Burroughs and Jack Kerouac's And the Hippos Were Boiled in Their Tanks is an electrifying true-life mystery, including afterword by James Grauerholtz in Penguin Modern Classics. This is a hardboiled crime novel, and a true story. In 1944, Jack Kerouac and William Burroughs, then still unknown writers, were both arrested following a murder: one of their friends had stabbed another and then come to them for advice - neither had told the police. Later they wrote this fictionalised account of that summer - of a group of friends in wartime New York, moving through each other's apartments, drinking, necking, talking and taking drugs and haphazardly drifting towards a bloody crime. 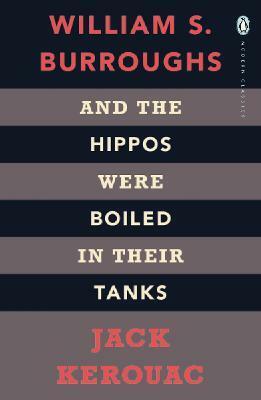 Unpublished for years, And the Hippos were Boiled in their Tanks is a remarkable insight into the lives and literary development of two great writers. If you enjoyed And the Hippos were Boiled in their Tanks, you might like Kerouac's On the Road, also available in Penguin Modern Classics. Kerouac wished, however, to develop his own new prose style, which he called 'spontaneous prose.' He used this technique to record the life of the American 'traveler' and the experiences of the Beat generation of the 1950s. This may clearly be seen in his most famous novel On the Road, and also in The Subterraneans and The Dharma Bums. His first more orthodox published novel was The Town and the City. Jack Kerouac, who described himself as a 'strange solitary crazy Catholic mystic,' was working on his longest novel, a surrealistic study of the last ten years of his life when he died in 1969, aged forty-seven. Other works by Jack Kerouac include Big Sur, Desolation Angels, Lonesome Traveler, Visions of Gerard, Tristessa, and a book of poetry called Mexico City Blues. On the Road: The Original Scroll, the full uncensored transcription of the original manuscript of On the Road, is published by Penguin Modern Classics.